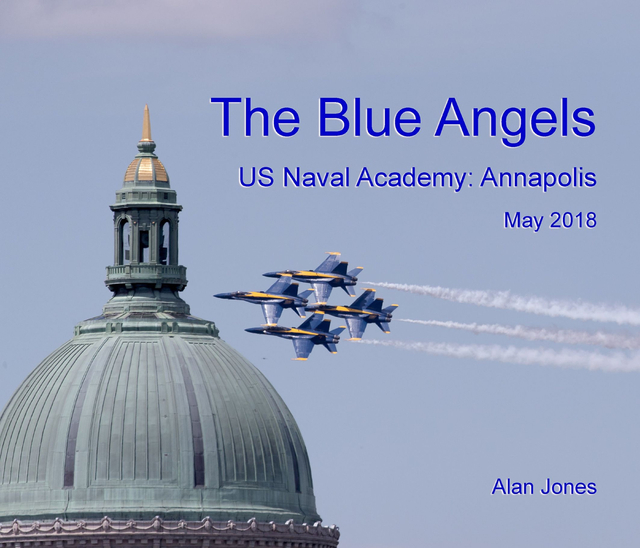 I have been to Annapolis a number of times as a visitor to the United States and on some trips had the opportunity to visit and tour the United States Naval Academy as well as many other historic buildings in the town. On this occasion my visit coincided with the Graduation and Commissioning Day for the Midshipmen who have been training at the Academy for four years. This ceremony attracts many visitors and family members to Annapolis: a very proud moment for them all. Every year as part of the ceremonial occasion the famous Blue Arrows, a Flight Demonstration Squadron, perform and entertain the crowds with their exciting air display. Effectively it’s two displays, the first day is a practice day and then the following day is the official display. I saw this event not only as something I really wanted to see, but an opportunity to obtain some wonderful photographs of their daring aerobatics. Flying took place over two days which was great for me. It provided an opportunity to get a feel for the action and the settings that would be required photographing aircraft flying at hundreds of miles an hour in the dull light of the practice day. Then on the morning of the Demonstration the day dawned with bright sunshine which was just right for the occasion. The Blue Angels provided a wonderful demonstration of aerobatics. I was delighted to have been there to see such an amazing display. If you ever get the opportunity to see them, don’t miss it, you will not be disappointed. Please be aware that the electronic versions of the book require a suitable size screen to obtain the best previewing experience. Versión ebook de composición fija, 74 págs.